AQUILINUS, a Bavarian priest who was offered the Bishopric of Cologne, but declined it so that he might wander preaching against Arianism. St. Aquilinus first went to Paris, and then to Lombardy where he was martyred by the Arians in 650 for preaching against their heresy. BLATH (FLORA), there are several Saints by the name of Blath (Latinised as Flora) listed in the Irish Martyrologies. While there is little information extant about them, we know of this nun, a humble woman of great sanctity, who fulfilled the obedience of cook at St. Brigid’s (1st February) monastery in Kildare. According to the Martyrology of Donegal she reposed 523. CAESARIUS, a first century deacon in Angoulême, Aquitaine. Many sources state St. Caesarius served under St. Ausonius (22nd May), the first Bishop of Angoulême. However, this is problematic as the diocese was not founded until the third century, and the same sources which list St. Caesarius as flourishing in the first century, also list St. Ausonius as flourishing in the third century as well. 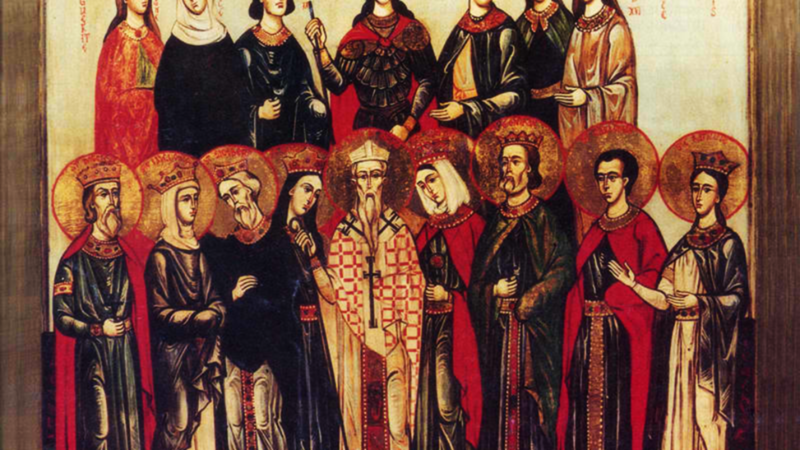 CONSTANTIUS and COMPANIONS, St. Constantius, the first Bishop of Perugia, is said to have been martyred along with a large number of his flock circa 170. Unfortunately, the extant Acts of St. Constantius are of doubtful credibility. DALLAN FORGAILL (of CLUAIN DALLAIN), (Also known as Dallán Forchella; Dallán of Cluain Dalláin; born Eochaid Forchella.) born in Connaught and a relative of St. Áedan of Ferns (31st January), he was a renowned scholar who went blind from his work (Dallán means “little blind one”). St. Dallán was the author of a poem in honour of St. Columba of Iona (9th June), called Amra Choluim Chille ('The wonders of Colum Cille') , published after St. Columba’s repose. There is a legend that upon publication of the poem St. Dallán’s sight was miraculously restored. St. Dallán was martyred by pirates at Inis-coel circa 597, who threw his severed head into the sea. According to legend, it was recovered and miraculously reunited with his body. GILDAS the WISE, a disciple of St. Illtyd (6th November), who towards the end of his life went to Brittany and lived as a hermit on the island of Rhuys until his repose circa 570. St. Gildas is famous for a work on the dire state of affairs in sub-Roman Britain, De Excidio et Conquestu Britanniae. PAPIAS and MAURUS, two Roman soldiers who were martyred (circa 303) during the Diocletianic Persecution. SABINIAN (SAVINIEN), having travelled from his native Samos in Greece to Troyes, St. Sabinian was converted to Christianity by St. Patroclus (21st January). He was the brother of St. Sabina (29th August), both of whom were martyred circa 275 near Troyes. SULPICIUS (I), Bishop of Bourges from 584 until his repose in 591. St. Suplicus is often confused with the priest and ecclesiastical historian Sulpicius Severus (†c.420) who was the author of a popular work on the Life of St. Martin of Tours (11th November). VALERIUS, according to the Roman Martyrology St. Valerius was a disciple of St. Peter the Apostle (29th June) and a Bishop of Trier. Most sources state St. Valerius flourished in the early fourth century which would make a relationship with St. Peter impossible, whilst there are those that place him in the first century. VOLOC, a saint in Scotland of possible Irish birth or parentage. Nothing certain is known about this saint, and some authorities believe he may the same as Fáelchú mac Dorbbéni, who served as Abbot of Iona 713–722 (reposing in 724), and who introduced the Roman tonsure into that Celtic monastery.